This can mean a lot of things to different people, but around here it is so much deeper than just being able to lift a heavy barbell over your head. The strength you get from exercise truly will transfer into other area of life. Exercise takes mental will to show up, it takes a deep drive to work hard and it takes a special spirit not to give up, no matter what is handed to you. Some of the key qualities you need to be STRONG at life! THE WILLPOWER METHOD® was the first format I became certified to teach. This format spoke to my heart from the very first squat I took in that class! It was a TOUGH fitness class, but it involved SO much more. It brought in a mental philosophy that I had never experienced in a workout! It made me feel STRONG inside and out! It changed me in such a good way and I am forever grateful that is where my journey began with fitness! If you have never taken willPower you are missing out. Our VFit classes fill up fast and I am so thankful my team appreciates this workout as much as I do. This was a program designed the help young girls develop both mental and physical strength. The class mantra for GirlPower is, “I am strong, I am confident, I can do ANYTHING!”. Doesn’t that bring chills down your arms?!? At the time, I didn’t have kids yet, but the idea of instilling such strength and values in our young girls was SO important to me. So I signed up and got to teaching this program to our community as soon as I could. As anything I take on, I put my whole heart and soul into this program to spread the word. The program was a success and we had a great group of girls for that inaugural run. I don’t need to go into the specifics of what we did each week, but I hope the time I spent with those girls and the values/hard work ethic and strength WE ALL learned together with GirlPower, is still carrying strong with those girls today. Since that first run, I went on to teach GirlPower many more times and even ran it as an after school, enrichment program for elementary school girls. Which brings me full circle to what “Strong Like Mom” has come to mean to me…….. It was during that first run of GirlPower that I found out I was pregnant with Emmie (I had no idea she would be a girl at that point!). As life goes and new chapters evolve, it is now my turn to teach these very lessons to my own children and to share this passion with my incredible team, so they too can pass this strength on to those around them. 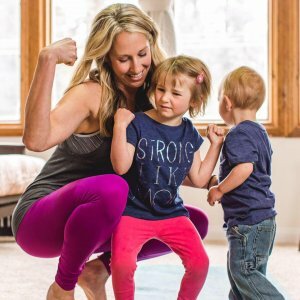 STRONG – a word I can only teach my daughter by example. I was taking Cardio Shred yesterday in the VFit Studio and Emmie joined me on her own will! I was smiling happy tears (and a ton of sweat by the end). You can see a quick recap here. This is such quality time for us when she joins me for a part of my workouts, which are so important to the rest of my day! We have fun (which exercise always should be! ), and she kept telling me to look at how 💪 she is!!! That strength she is building will without a doubt carry over into every other area in her life! Even if my old gym had daycare, I don’t think there’s any other way I’d rather be doing this right now. My ❤️ is full! So if you are reading this, take that GIRLPOWER mantra into EVERY area of life, every workout, and every challenge. I AM STRONG, I AM CONFIDENT, I CAN DO ANYTHING! Own it, believe it, and live those very words. You do not have to be a mom for this saying to mean a lot. Every woman out there has the opportunity to be a positive example to someone else. And as with most things, ACTIONS speak louder than words.